夏要伟, 郭金运, 刘路, 等. 基于运动学和简化动力学的SWARM卫星精密定轨研究[J]. 大地测量与地球动力学, 2019, 39(4): 392-398. XIA Yaowei, GUO Jinyun, LIU Lu, et al. Precise Orbit Determination Research of SWARM Satellites Based on Kinematic and Reduced-Dynamic Methods[J]. Journal of Geodesy and Geodynamics, 2019, 39(4): 392-398. National Natural Science Foundation of China, No. 41774001, 41704015; Special Project of Basic Work of Science and Technology, Ministry of Science and Technology, No. 2015FY310200; Natural Science Foundation of Shandong Province, No. ZR2017MD032. GUO Jinyun, PhD, professor, PhD supervisor, majors in space geodesy, marine geodesy and physical geodesy, E-mail:jinyunguo1@126.com. XIA Yaowei, postgraduate, majors in space geodesy, E-mail:973011440@qq.com. Foundation support: National Natural Science Foundation of China, No. 41774001, 41704015; Special Project of Basic Work of Science and Technology, Ministry of Science and Technology, No. 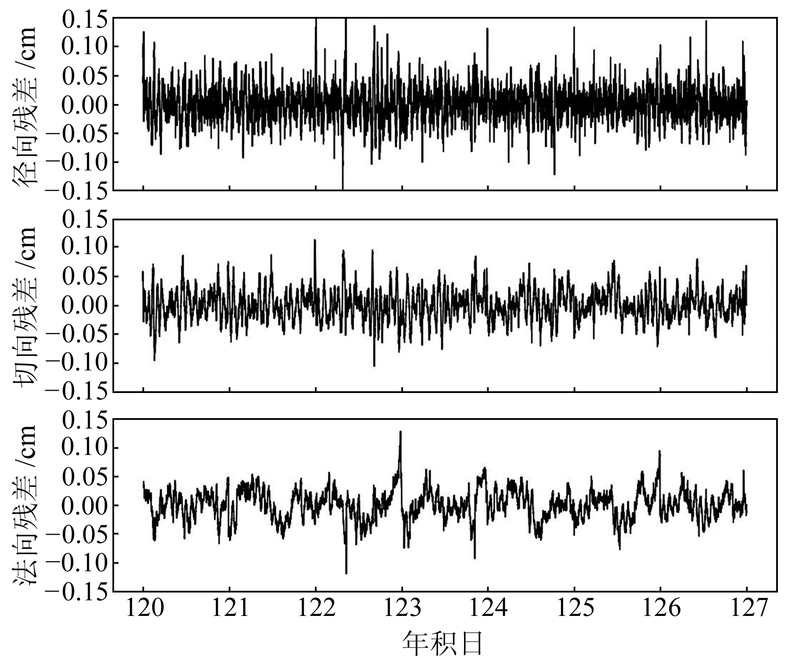 2015FY310200; Natural Science Foundation of Shandong Province, No. ZR2017MD032. About the first author: XIA Yaowei, postgraduate, majors in space geodesy, E-mail:973011440@qq.com. Corresponding author: GUO Jinyun, PhD, professor, PhD supervisor, majors in space geodesy, marine geodesy and physical geodesy, E-mail:jinyunguo1@126.com. Abstract: In this paper, based on kinematic method and reduced-dynamic method, using on-board GPS observation data, the precise orbits of SWARM are implemented. The orbit accuracy is assessed using the post-scientific orbit released by ESA. The results show that the seven-day average RMS values of radial, along-track and cross-track directions of kinematic orbits are all less than 3 cm, and the accuracy of orbit determination reaches the centimeter level. The radial RMS of reduced-dynamic orbits is about 0.65 cm and the along-track and cross-track directions are about 1.3 cm, which are better than expected. In addition, the fast orbital precision of SWARM, based on fast ephemeris released by IGS, is approximately equal to that of precise orbit determination. However, in the near real-time orbit determination of SWARM satellite, the 3D-RMS of kinematic orbit determined by ultra-fast ephemeris is 9.68 cm, and the 3D-RMS of reduced-dynamic orbit is 3.61 cm. The accuracy of the orbit is lower than the fast ephemeris results.